We assume that you already installed Node.js and can run `npm` on the terminal (Mac OS/Linux) or Node.js command line (Windows). Now, update or install Ionic 3 and Cordova with the latest version. Open terminal then goes to your Ionic 3 projects folder then type this command. On the terminal or Node.js command line type this command to create a new Ionic 3, Angular 5 and Cordova App. As usual, you will see this page in the default browser. Now, let's get your hand dirty. We will create our own calendar UI or view from scratch. This basic calendar will very simple, it just Month header with previous and next month button. Now, open and edit `src/pages/home/home.ts` then add these variables to the constructor. Next, create the function for push calendar date items to the arrays that will be displaying the full calendar date. Now, add the function for previous month button action. Also for the next month button action. Next, open and edit `src/pages/home/home.html` then simply replace all HTML tags with this few lines of HTML tags. Now, we have to give it a little cosmetics. Open and edit `src/pages/home/home.scss` then add this lines of CSS style. That's it, your own simple calendar is ready for some action that will create later. Now, test your own calendar UI by run the Ionic 3 Angular 5 app on the browser. To integrate the calendar with native Ionic 3 Cordova calendar plugin, type this command to install it first. Now, open and edit `src/app/app.module.ts` then add this import. Add `Calendar` module to `@NgModule` providers. Now, it's ready to implement in the pages. To add an event to the calendar we have to create a new page that contains a form of event. 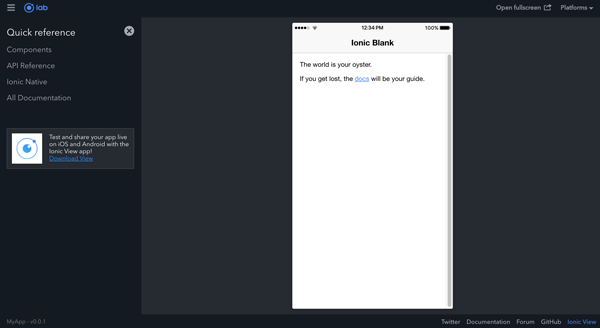 Type this command to create a new Ionic 3 page. Register this new page to `src/app/app.module.ts` by add this import first. Add the `AddEventPage` to `@NgModule` imports and `entryComponents`. Before adding a form to the new page, add button first to the home page for opening the new page. Open and edit `src/pages/home/home` then add this lines of tags on the `<ion-navbar>` after `<ion-title>`. Open and edit `src/pages/home/home.ts` then add this import. Add this function for open event form page. Open and edit `src/pages/add-event/add-event.html` then add this lines of tags inside `<ion-content>` tag. Now, open and edit `src/pages/add-event/add-event.ts` then replace and add this imports. Inject calendar and alert into constructor. Add a variable for holding event object before the constructor. Next, create a function for saving the event. To add events to calendar UI, open and edit again `src/pages/home/home.ts` then modify and add this imports. Add this variables for hold and populate events. Inject the calendar native plugin to the constructor. Add this function for load all events in the current month. Create a function for checking the event on the specific date. Create a function for showing the selected date events. Last, create a function for delete an event. Now, open and edit again `src/pages/home/home.html` then replace all tags inside `<ion-content>` with this. This Ionic Cordova Calendar plugin need to run on the device or simulator. For that, remove and add again the iOS and Android platform by typing this command. Now, you can run on the devices or simulator by typing this command. 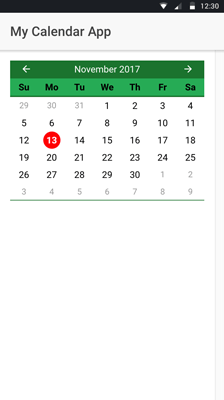 That's it, this example of Ionic 3 Cordova Calendar event not completed because the feature of the plugin not cover all functionality on Android and few on iOS. We know there's a lot of lacks because this is just an example of how to create your own Calendar UI instead of using existing Calendar UI library. You can find the full source code on our GitHub.